THE UK now has 6,324 call centres and they employ approaching 1m people. Both figures represent a small annual rise and researchers expect a moderate decline this year before growth continues next year. 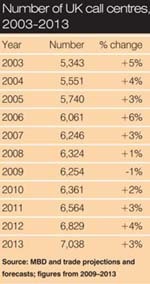 The figures are from a detailed 75-page study, UK Call Centre Market Development 2009 (see end of article for reader offer), by Market and Business Development (MBD). It forecasts a fall of about one per cent in the number of call centres this year and comments: “This is largely due to the current economic downturn resulting in an increased focus on cost cutting measures by companies…. In fact, says the report, the number of agent positions in outsourcers has grown by 12 per cent to 77,600, 15 per cent of all UK agent positions. And it expects growth of four per cent this year. 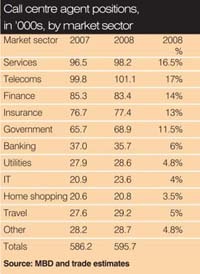 Looking at all UK call centres, telecoms remains the largest sector with 16.5 per cent of agent positions, followed by services, which includes a large number of business-to-business call centres, at 17 per cent. 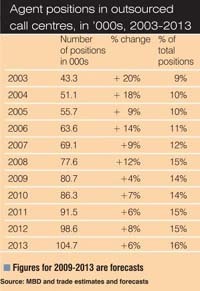 However, the three sectors in financial services — finance, insurance and banking — have a total of more than one-third of all agent positions. MBD expects an element of growth to come from “customer interaction centres”, where companies email and web-based responses in real time, in support of telephone services. And it also expects gains in productivity, partly due to advances in outbound calling technology. It highlights concerns that productivity could decline due to Ofcom regulations over abandoned calls unless call centres hire more staff or invest in technology. Commenting on offshoring, MBD says: “Despite the adverse publicity regarding the offshoring of call centre operations, trade sources report the offshoring movement is not likely to disappear anytime soon. And it believes that the shift of jobs abroad has had little impact on the market, supported by the continued growth in the number of UK call centres. 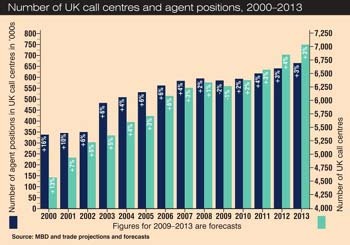 The average size of a UK call centre is 94.2 agent positions, roughly the same as 2007, but a steady growth over previous years. 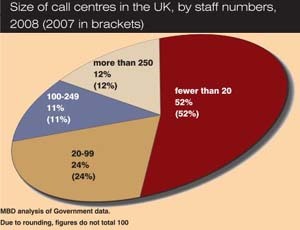 However, the report shows that just 12 per cent (about 760) of call centres employ 250-plus people. Half have fewer than 20 staff and just over a third employ 20-249 people. 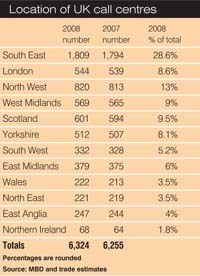 The north west follows with 13 per cent, with Scotland on 9.5pc and London on 8.6pc. Cheaper and better internet rates would lead to greater demand for internet-based customer support and demand for VoIP systems is also expected to grow strongly. And there would also be growth in the use of speech and voice recognition. 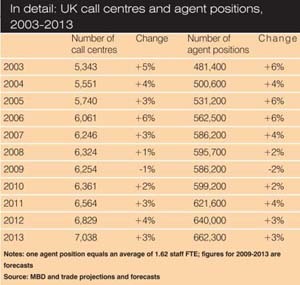 MBD’s report, UK Call Centres Market Development 2009, costs £600. However, Call Centre Europe readers qualify for a 10pc discount, bringing the price down to £540. Contact enquiries@mbdltd.co.uk, ensuring that you mention “Call Centre Europe offer”.